TRAGEDY IS A VEHICLE FOR SELF-KNOWLEDGE. individual, the community, and the gods. Tragedy is an imitation of an action involving incidents that arouse fear and pity. How does the protagonist react to the situation? What choices does he or she make? How does she or he confront life when faced with difficult choices? There is a specific moment of friction in the play that produces the dramatic action. The tragic action should involve an error in judgment made by the tragic figure (hero) in the play. commits an error in judgment that inevitably leads to his or her downfall and sometimes to greater wisdom. hamartia is hubris (= excessive pride). identifying with the suffering of the tragic hero. How do they behave in the face of impossible situations? How do they choose between two equally valid options? How do they explain (or justify) their choices and actions? Are they willing to assume responsibility for their choices and actions? 12 000 spectators in its 55 rows. of Dionysus in Athens was about 60 feet in diameter. overlooking the orchestra, and often wrapped around a large portion of the orchestra (see the diagram below). 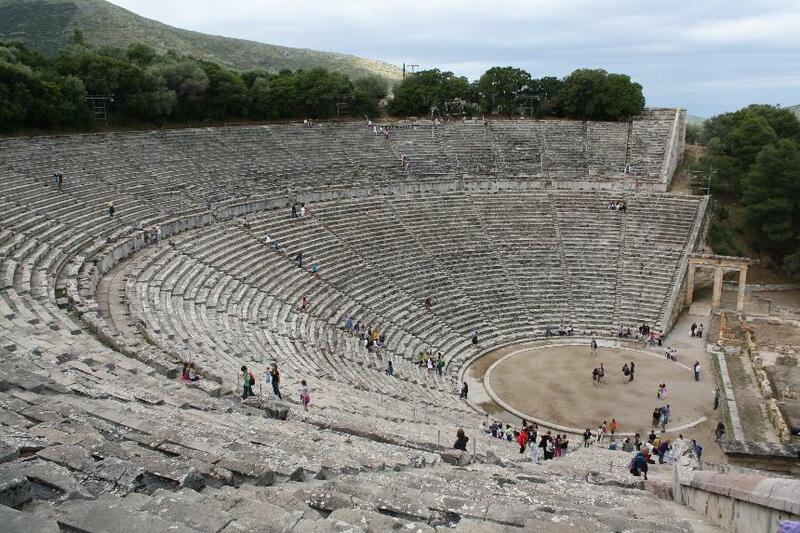 of many Greek theaters had marble seats. skene from behind, so that actors playing gods and other characters could appear on the roof, if needed. used them to enter and exit the theater before and after the performance. After a prologue spoken by one or more characters, the chorus enter, singing and dancing. between the characters and the chorus. For the rest of the play, there is alternation between episodes and stasima, until the final scene (exode). episode, the chorus remains on state while other characters usually leave. puts it into a larger mythological framework. actions and outcome of the play. defeated and Thebes is safe. enters, and reports that someone has tried to bury Polyneices. Creon reacts with anger, threatens the guard. First Stasimon: The Chorus dances and sings its Ode to Man. argue, Creon decrees she will die. Ismene is led in. Third Stasimon: The Chorus sings a song about the power of the god Eros. Fourth Episode: Antigone, lamenting her fate to the Chorus, is led to the cave. judgment, and rushes to bury Polyneices and release Antigone from the cave. Exodus: A messenger reports the deaths of Antigone and Haemon. Euridyce, Creon's wife, commits suicide.